Good news for Cayman Islands vacation home owners this year: Tourism numbers are up and, with that, real estate sales. 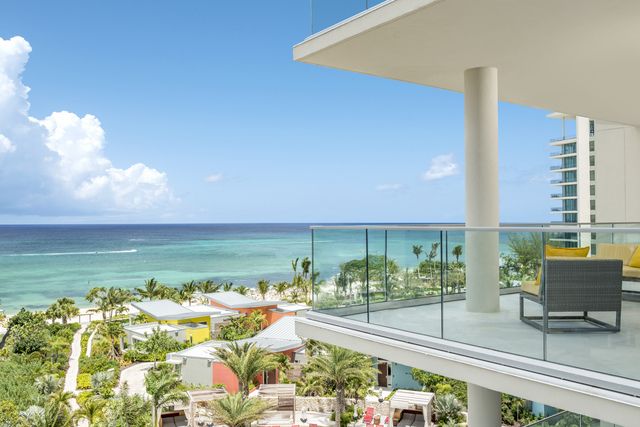 A recent independent report singled out the sales launch of luxury condominiums affiliated with the Kimpton Seafire Resort + Spa on Grand Cayman as representing a significant amount of the luxury condominiums sold. We’ve been following the Residences at Seafire located on Grand Cayman since the project was announced. Lodged in a ten-story LEED ® Silver-certified building designed to Miami-Dade hurricane standards, the Residences at Seafire offer residents unlimited access to all the amenities and services of the AAA Five Diamond-rated resort property: communal amenities with interiors by acclaimed designer Martyn Lawrence Bullard, three signature restaurants, an 8,500-square-foot spa, a state-of-the-art fitness center, and a spectacular setting on famed Seven Mile Beach on Grand Cayman Island’s western shore. The Residences include 62 condominium units ranging from 600-square-foot studios to 4,000-square-foot, five-bedroom homes and penthouses, listed from $1.5 million to $8 million. Developer Dart Real Estate recently added the neighboring Ritz-Carlton, Grand Cayman, to its portfolio, and announced another luxury brand with approximately 225 guest rooms, 80 residences and 10 villas with ocean views of Seven Mile Beach, the North Sound, and the Camana Bay Town Centre is also included in their master plan. Click here to see the story and have a look at one of their gorgeous beach destination homes.